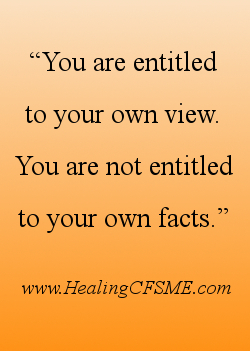 For 14 years I lived disabled with severe Chronic Fatigue Syndrome (CFS). This website shares alternative healing therapy to help you to experience health within illness as well as to bring greater physical health. My initial diagnosis was for Post Viral Fatigue Syndrome, followed by a diagnosis of Myalgic Encephalomyelitis (ME illness). At some point I was given a Chronic Fatigue Syndrome diagnosis which is favoured by my current Doctor. I continue to prefer the term ME. I have also been mapped for Fibromyalgia. I have involuntary movements and relate to the experience of those with a diagnosis of Dystonia or FNS - I have not however pursued this diagnosis for myself. Those living with auto immune disorders such as Lyme disease and Lupus share many of the same symptoms and life challenges of CFS/ME, particularly "spoonies" who also experience chronic fatigue at a disabling level. Many of the alternative healing therapy articles on this website are not symptom specific and apply to anyone living with chronic illness and/or interested in emotional healing. In May 2008, as the result of faith healing and an alternative healing therapy based on Neurolinguistic Programming (NLP), I went from bedbound to walking, from not being able to speak in normal sentences to talking once again. This website shares information about alternative healing therapy which has helped me to experience dramatic physical healing of symptoms. I continue to live with Chronic Fatigue Syndrome / Myalgic Encephalomyelitis. I celebrate all that I can now do. I will share the tools and attitudes I have collected along the way to help me find a rich life within illness. 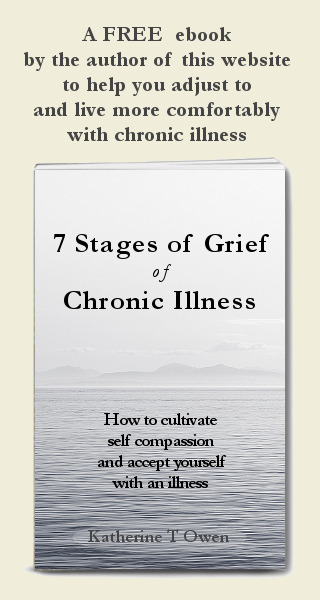 Knowing about the stages of grief - see the free ebook above - is one way to help us find more self acceptance and self compassion. Information about the illness with which we live can be powerful in reducing the stress of uncertainty. 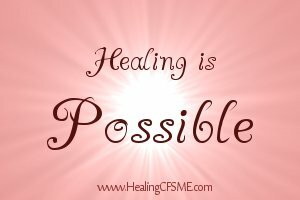 Some articles on this healing website talk about the possible cause of CFS and tests for CFS. I also share CFS news and research as I come across it. Living with Chronic Fatigue Syndrome or any chronic illness is a tremendous physical challenge. Alternative healing therapy can increase your chances of physical healing. Many people living with chronic illness are housebound or even bedbound. Access to treatment can be difficult at the time when it is most needed. The emphasis on this healing website is on self healing which we can carry out in our own home. ... to allow God access to bring the healing which better reflects our reality in Him/Her. Whatever language you use, healing therapy allows you to take practical steps at home to keep as healthy as possible, in body, mind and Spirit. DISCLAIMER: I use the accepted term of 'alternative healing', but it is more accurate to refer to complementary healing'. All the healing therapy included on this website can and should be used to complement / work alongside the advice of your doctor. Healing / Wholeness can be found in physical health. But it can also be found within illness. 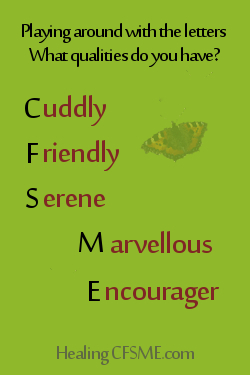 This CFS website shares information to increase your ability to live well with and find the emotional resilience to cope with Chronic Fatigue Syndrome /Myalgic Encephalomyelitis or any other chronic illness. Coping with chronic illness is likely to bring up new, often uncomfortable emotions. You may go through many emotions as you mourn your loss of health, including the emotion or even the illness of depression. In a time of illness, it can be important to cultivate your sense of self worth. If you are treated badly or experience neglect, remind yourself that the way you are treated is not a reflection on your worth. You may need to learn emotional healing skills to cope with disbelief or lack of understanding of chronic illness from other people in your life. You will need to learn to say No and to ask for the help you need. These natural healing articles aim to help you to find inner peace, self love, self worth and self acceptance in your life right now, regardless of your state of health. When you are in pain or symptoms are pressing in it is helpful to be reminded - you are OK just as you are. Self help books were so important to me through the years of isolation. Yet I also found (and continue to find) that many books on self healing didn't apply to a situation as extreme as my own. Sometimes these books on self healing leave me feeling I am wrong to be living with illness or I should be able to heal from one moment to the next. Other self healing books that do speak of serious illness validate my pain and distress, but dwell so continuously on the symptoms and difficulties that they leave me feeling hopeless rather than uplifted. This website and my healing books aim to help you to be gentle with yourself during the difficult time of living with chronic illness as well as to inspire you to find a greater quality of life or to find physical healing. The website will include articles on spiritual healing - spiritual surrender to God (however you understand the word God). Much of the alternative healing therapy discussed on this website works with spiritual principles, though it may be unnecessary to hold spiritual beliefs to apply the techniques. Mine has been a personal spiritual journey, much of it walked within the solitude and silence that accompanied being bedbound with severe Chronic Fatigue Syndrome. Whilst I resist labels, you may be interested to know that I am an interfaith, non duality Christian and a student of A Course In Miracles. Welcome to this alternative healing website! Whether you stay and wander here a while, or whether you move on, thank you for being here in this moment. It's OK to live with illness. It’s OK to get well.